Today, February 11, 2014, join the Power Rangers as they face off against the dreaded villains King Mondo and Queen Machina, a malevolent pair who rule over their Machine Empire, when Shout! 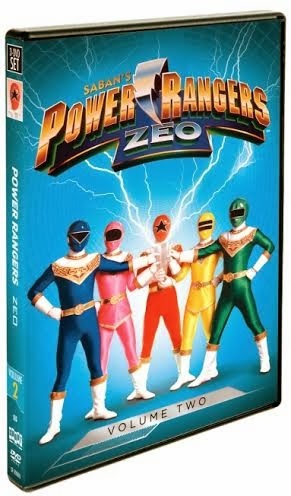 Factory releases Power Rangers Zeo, Volume 2, a 3-DVD box set that contains the final 25 episodes of the series. My daughter is a huge fan of The Power Rangers. She's been loving them for the past couple of years. She even was a Pink Power Ranger last year for Halloween. I can't believe that one of my childhood shows I use to watch is still on with brand new rangers. When we received the 3 disc DVDs, my daughter was super excited that she could watch one of her favorite shows any time she wanted and even watch a few episodes from volume two that she hadn't seen before. One of the things the hubby and I love is that there are still shows out there from when we were younger so we can share and compare how they've changed and how some have stayed the same with our kids. If you have a kid that's a fan of Power Ranger Zeo be sure to head to the store as volume two is now out today on DVD to add to your collection! Disclosure: All opinions are my own. I received Power Rangers Zeo Volume 2 on DVD at no cost for the purpose of this review. No other compensation was received.